Adrian Torres (28) comes from Cadiz and he paints mixing different techniques on canvas. The handsome artist's works are amazing and i-Marbella decided to find out more about Adrian. I did my Art career in Sevilla and Barcelona, and later on went to Ron Tomlinson in Forth Worth, Texas, (U.S.A.) to finish my studies. 2. How did you become an artist? Did you always wanted to become one? I used to do drawings all the time since I was a kid, I always knew I wanted to be an artist; this is the only way to feel good with myself. 3. How does your works differ from other artists' paintings? In my opinion, every single artist is different, as every one of us has his own universe that we try to express in our paintings. In my own, there is a lot of energy, I think that life should be lived with passion and always in positive attitude and this is what I try to reflect in my work. It is an amazing feeling, when you see that the people who examine your paintings feel that energy. From everything that gives me good vibes, the colours and music are essential in my life. 5. What do you love about your job the most? The least? There is absolutely nothing that I don´t like about my job, it is the best thing I have, and I feel lucky to work on the things I like, and therefore I will always fight for that. 6. What are your ambitions? To keep painting, growing, and that people will get to see my work more and more. I try to paint all the time I can, but I take some breaks to clear up my ideas, I do sport, hang out with friends, go for long walks with my dog, and watch a good movie. 8. Name your favourite vacation destinations. I like Barcelona, I enjoyed my time when I used to live there, whenever I can, I fly over there, I also like Miami, it is a good place to have fun. I might go this year to Thailand, and would like to visit Costa Rica and Australia. 9. Do you have a special message for i-Marbella readers? 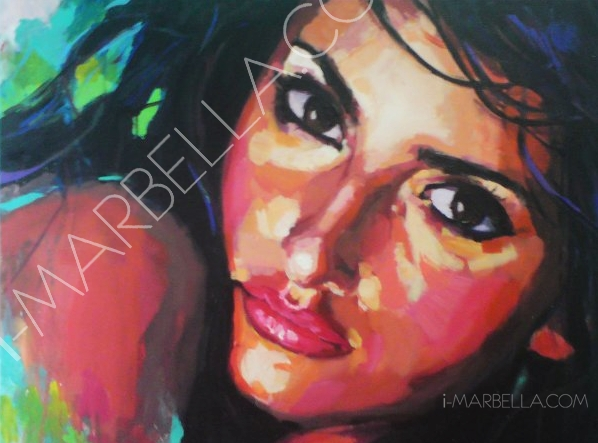 I want to thank the people who like my work, I´m very linked to Marbella as we market my art from there, Theresa Bernabé (www.TheresaBernabe.com) is my art dealer, and would like to thank the great reception that my work had over there….. You will be able to see my new work very soon in Marbella!!! he is handsom, where i can meet him :)! !